When we think of ocean life, our minds typically pictures sharks, fish or whales, but rarely do we immediately picture seaweed. However, seaweed is all over the ocean and has been for more than 600 million years. It is not a true plant, but categorized as a non-vascular protist; this means that seaweed does not have a system to transport food and water, so seaweed makes its own food from the energy it gets from the sun. This process is known as photosynthesis. This makes seaweed an algae, in addition to the fact that it doesn’t have leaves, roots or stems. 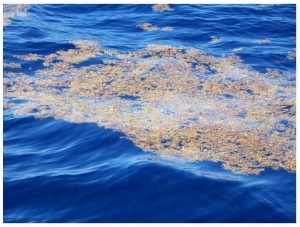 Pelagic Sargassum is a brown to olive green colored algae which belongs to the brown algae family. Other species grow typically on the live rock however, sargassum if the only floating seaweed. They have different types of tissues such as stipes, fronds or fruiting bodies, whereas some of the species are known to have gas-filled bladders. The air bladder of the sargassum helps the seaweed to stay afloat and thus can be closer to sunlight. Many of these species have robust and flexible body with a rough sticky texture, which helps them to withstand strong water currents. Sargassum provides refuge for migratory species and essential habitat for some 120 species of fish and more than 120 species of invertebrates. It’s an important nursery habitat that provides shelter and food for endangered species such as sea turtles and for commercially important species of fish such as tunas. Sargassum are found near-shore. They are the inhabitants of tropical areas and can be found throughout the world. They float freely in the ocean near the surface. Due to the prevalence of this algae, the waters around The Bahamas and south east Florida are knows as the Sargasso Sea. Sargassum has a lifespan of about 3-4 years. This species can reproduce both through floating fragments and sexually. The fertilization generally takes place on the surfaces of the reproductive bodies and in this process thousands of “germlings” are released.